TEMPANY DECKERT: IS YOUR DESK GOOD FOR CREATIVITY? IS YOUR DESK GOOD FOR CREATIVITY? 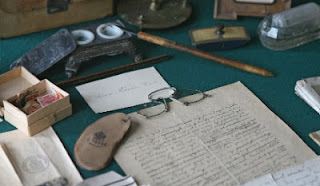 This is Anton Chekhov's desk, one of my favorite writers. It got me thinking about the energy and feng shui of a creative space. Does the way you set up your desk help or hinder your writing? I decided to ask an expert in organizing, Teresa Nicola of www.collectedspaces.com what her top organizing tips are for a great writing space. Read below! Thanks Teresa for the awesome tips! A creative space is all about clearing the non-essential and keeping the useful and inspirational. It makes me cringe when people have a mini office in their bedroom. A bedroom is meant for resting and intimacy, not working. So hopefully there is some other space in the home that can be dedicated to creative work. The ideal creative space will have good airflow (our brains need oxygen) and plenty of natural light (a natural body energizer). Add air-purifying plants or full spectrum lights if either is lacking. Never sit with your back to the door - it creates anxious energy. If your desk faces a wall, turn that wall into an inspirational wall. Hang a painting or pictures of people whom you admire, create a row of plants (money trees maybe! ), whatever it is for you that evokes a sense of joy and well-being. Facing a window can either be distracting or helpful - experiment. 2. Clear out the non-essential. This doesn't mean clear out the personality. This means removing any items that are not useful and inspirational. Clear space, clear mind, clear thinking. It's hard to get in a creative mind set when there are visual reminders of things that need to get done all around you. If you can't get to things right away, then make a master list of organizing projects you want to get to, and then block out time in your calendar to address them. When you assign a "time to a task" or "when to a what" - the task stops nagging you. If there are unidentified foreign papers (UFP's) lying around everywhere, then it'd be in your best interest to go through them, categorize, label, and file/pile them away. Create a space for your action items and projects, reference items, and permanent records. 3. Define what you need and love and give it a home. What activities occur in this space? Writing, researching, mailing/shipping, reading . . . ?What tools do you need to do those activities? What materials do you need to reference often? They should be an arms length away. wonderful post.Thank you so much for sharing this post.